With our modern fleet of 7 trucks and over 200 swap bodies and partnerships with freight carriers working for us nationwide, Fass-Braun GmbH offers you a high level of flexibility and reliability. 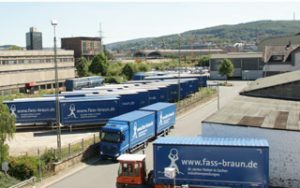 With a capacity of currently 1,500 tight-head drums, 600 open-head drums and 400 containers per day, Fass-Braun GmbH has the scope to meet your needs. Together with over 60 qualified employees Fass-Braun GmbH aims to solve any task you assign to us to your complete satisfaction.